Watching the Irish Open today and seeing the Swede Johan Edfors doing well in some harsh links conditions got me to thinking about keeping warm while playing golf (Those guys at the Irish Open are going to need some Irish Whiskey to keep warm after the round ). One piece of golf apparel that I received from Puma Golf recently was their Golf Graphic Track Jacket and this has been a great addition to my golfing attire especially for those cool morning rounds. The jacket I received was XL in gray violet. I first wore the track jacket extensively at the beginning of the season at the driving range trying to work out the swing kinks. The thing I loved about it was it not only kept me warm but it it also kept me dry with Puma's moisture management system. It wicks any moisture away from your skin. Great for us here in Canada where one day it can be in 30's and the next you can be dealing with frost delays. I usually don't wear golf apparel that fits to tight/snug but Puma Track Jacket is very fitted and this was another feature I really like about it. When you were swinging the club it never hinder your swing in the least. The XL fit my frame to a tee and even with the rib knit cuffs and hems and the raglan sleeves there was still plenty of room for my 6'5" frame to swing any club from the driver to my wedges. The design of the front of the jacket is inspired by Puma Golf's 18-hole logo definitely very flashy and it was something that I'm not accustomed to wearing so it did take awhile for me to get use to (As well as my kids saying "boys don't wear orange" I had to get over). So if your not into brighter colors you might want to check out the black version of the Golf Graphic Track Jacket which is a little more subdued. If your into golf apparel that's both fashionable and functional then look no further than the Puma Golf's Graphic Track Jacket. Great for keeping you warm and not bulky so you can freely swing the club. Puma's 18 Hole logo design looks modern and flashy great for on or off the golf course. 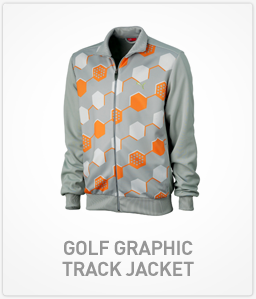 The Golf Graphic Track Jacket is 100% polyester machine washable warm, line dry. It comes in either black or gray violet and in sizes ranging from XS to XXL. Right now at Golf Town it can be your for $99.99 but I have seen it for cheaper at a few online stores.